I know it’s not the “politically correct” thing to admit in a Japanese magazine about martial arts but it’s true: I didn’t learn the Nippon Budokan as a martial arts venue; I probably had seen pictures of various demonstrations or tournaments but since my Japanese was pretty much non-existent back then (i.e. the late 1970s) the name hadn’t registered. It did register though when I bought Deep Purple’s “Made in Japan”, the legendary live album from the group’s 1972 Japan tour, their first and one that would be immortalized in their later hit single “Woman from Tokyo”; since that day, like most people my age, I thought of the Nippon Budokan as Tokyo’s “hall of rock ‘n’ roll” and I kept thinking it as such until I read it’s actual story. By then I was already into the martial arts and the idea that there was, in the middle of Tokyo right next to the Emperor’s Palace a huge hall dedicated to the martial arts and actually being called “the hall of martial arts” seemed wonderful and the undeniable proof that the Japanese have a very deep relationship with these arts -otherwise they wouldn’t had spent 2 billion yen to build it, right? Well, things are a little more complicated: not all Japanese do martial arts, many of them aren’t even interested in martial arts, there are probably more non-martial arts related events on a yearly basis in the Budokan than not and the reason the venue was built was to host judo in the 1964 Olympics. Still it remains imposing, especially if you are indeed going there for a martial arts event. My first was the Kagami Biraki/Budo Hajime of 2012 but my first classical martial arts event was this year’s Nihon Kobudo Taikai, the 37th organized and one marking the 35 years of the Nihon Kobudo Kyokai. And it proved to be quite remarkable, both in the sense that it included over a dozen of schools I hadn’t seen before and in the sense that it happened on February 9, the weekend Tokyo was hit by the biggest snowstorm in the last 40 years. 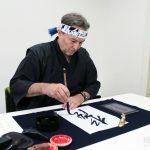 It might sound incredible but leaving my home in Asakusa in the morning I wasn’t really sure I’d make it to Kudanshita – and we’re talking about a 20-minute train ride! 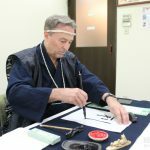 All this was over though when the kaburaya signal arrow from the bow of Ogasawara Kiyomoto, son of Ogasawara Ryu’s present soke, Kiyotada (who was one of this year’s recipients of meritorious service awards – the other was Jikishinkage Ryu soke Sonobe Masami) passed whistling across the Budokan’s demonstration area; I’ve had seen and heard those arrows before (incidentally the particular one is called “hikimeya”) but never in an enclosed space and the effect was much more impressive. It’s a shame that more people weren’t around to hear it and at the same time watch the Ogasawara etiquette in its purest form but the weather had taken its toll: even though the demonstrators were all there, the crowd was very thin, at least for Budokan’s 20,000 seat capacity. After the ceremonial introduction by the Ogasawara Ryu, the regular demonstration began; as I mentioned before, I’d seen about half of the 35 schools participating so this left me with 12 schools to comment on –with so little space available I can only convey my impressions hoping I’m not doing injustice to traditions with a history going back several centuries! Okinawa Goju Ryu Bujutsu: I was familiar with Goju Ryu karate, the style of Chojun Miyagi and the Higaonna family but this was the first time I saw their conditioning exercises (were practitioners hit each other with punches and kicks) and their more complex repertoire of techniques involving breaking the opponent’s balance, throwing them and delivering a finishing strike. The techniques bring to mind those of jujutsu schools (and judo’s self-defense) and it’s amazing how often karateka overlook the fact that a conflict can’t only consist of a cinematic exchange of punches and kicks. Kingai Ryu Karate Okinawa Kobujutsu: I have seen Hayasaka Yoshifumi’s blend of Okinawan arts before; the reason I am mentioning it here is because the tireless researcher demonstrated this time two aspects of his curriculum that hadn’t been shown in previous events: a kata with the boat oar (eku) and one (executed by himself) using a sword and a shield (tinbei) made, I believe from a sea-turtle shell. The Chinese connection of these kata was apparent (even the sword looked more like a short miao-dao) but what was more noteworthy was the resemblance of some of the eku techniques to naginata techniques found in several Japanese naginata schools. Jigen Ryu Hyoho Kenjutsu: Now this is a school I’d always wanted to see! The Sengoku period rough-and-tough tradition from Kagoshima has nothing polished about it: they don’t even use bokuto for the most part – just tree branches which they wear off by repeatedly hitting a makiwara (also a big chunk of a tree trunk). Impressive is also their kiai, a continuous shriek that brings to mind the berserkers of the old Scandinavian legends. Probably the techniques involved are more sophisticated than they appear at first sight (in the continuous attacks the cuts were very precisely grouped) but there was nothing pretty in these techniques: from the improvised weapons and protectors to the strategy, everything is ugly and terrifying – as a true battle must have been. Kanemaki Ryu Battojutsu: I’d seen this school in videos and was curious to see how they implement the elements coming from our common ancestor, the Toda Ryu. Since their curriculum consists only of solo sword-drawing kata, any influence wasn’t that apparent but their body movement is interesting – especially the stances where they cross their feet and bend both knees. Also worth noticing is that they are all performing wearing a set of clothes similar to samue workclothes: a jacket and the Portugese pantaloons-inspired tight hakama called “karusan”. Nitto Shinkage Ryu Kusarigamajutsu: To be honest, this is a school I hadn’t even heard – let alone seen – until now. Reportedly descending from Miyamoto Musashi (hence the name) they use their twin kama (one a kusarigama with a very thin chain and the other a kama with a spear-like point above the blade) in a fashion similar to that of Musashi’s jujidome against the sword; perhaps the most memorable element of their demonstration was the accuracy of the strikes with the kusarigama against an opponent wearing protective gear on the head and the wrist. Quite different from how we use the weapon in Toda-ha Buko Ryu but interesting never the less. 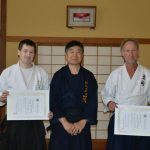 Shibukawa Ryu Jujutsu: Another school I’d heard of (particularly about its fame during the Edo period and its connection with Sekiguchi Ryu) but never had the chance to see. The techniques against the knife was pretty much standard jujutsu but of particular interest were the other two segments, one with bo against the sword and the other with jutte also against the sword; schools focusing on the jutte are not that common and having a special interest in the Edo period I found that set very exciting. This been said, I still consider putting a short, non-bladed weapon against a sword a rather odd choice; even for a policeman (jutte was a lawman’s weapon/symbol). Unko Ryu Kenjutsu: At first appearance this school, also from Kumamoto, is a rather straightforward kenjutsu school of the early Edo period. What was intriguing though was that their kata illustrated both the influences of earlier battlefield kenjutsu (simple exchanges of two techniques, low stances, cutting with the middle of the sword etc.) and some glimpses of the new, suhada kenjutsu (higher stances, cutting with the top part of the blade especially on the crown of the head) that would later become kendo. Deceptively simple, this is definitely a school worth examining! Itosu Ryu Karate: My stint with karate was somewhat less than three years and that was over 25 years ago but even someone with so little exposure to the art has heard of the legendary Anko Itosu (1831-1915) the teacher of all karate greats like Gichin Funakoshi, Choki Motobu or Kenwa Mabuni. Therefore, it was a pleasure seeing a demonstration by two members of his lineage, particularly when one of them was soke Sadaaki Sakagami. Like Goju Ryu, the Itosu Ryu techniques were not flashy but simple and effective and also included throws similar to those seen in jujutsu schools; overall a great lesson in the realities of conflict often missing from modern sport karate. Shojitsu Kenri Kataichi Ryu Kenjutsu: One more kenjutsu school from the early Edo period (and also one that I’d only heard of). The first part of their demonstration was a set of jo against sword where the jo wins – rather strange for a kenjutsu school- and the second, a seated set of sword against sword set with sheathed bokuto – thus involving a batto element. Like Unko Ryu, there is here also a mix of elements from early and later kenjutsu as well as a rather unique notto done with the cutting edge downwards; I know a part of their curriculum is performed in yoroi and reflects the era it was developed but unfortunately it was not demonstrated this time. Enshin Ryu Iai Suemono Giri Kenpo: An iai school with some impressive tameshigiri: I’m sure everyone marveled at the vertical cutting in half of a free-standing bamboo performed at the end of their enbu that the Enshin Ryu calls “ryusui-giri” (I had the opportunity to examine the cut piece and the cut was perfect!) I’d certainly like to learn more about the bunkai behind their kata – there were some rather puzzling moves in there. 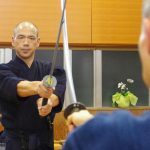 Bokuden Ryu Kenjutsu: Who in the weapons arts world doesn’t know Tsukahara Bokuden ?and who doesn’t want to see his legacy? The Bokuden Ryu from Aomori presented one rendering of this legacy in a plain, no-nonsense set of sword against sword with low stances, a choice of targets echoing a yoroi’s weak spots, quick one-technique kata and ferocious zanshin. Certainly among the demonstrations highlights and one that makes you almost feel sorry for living in Tokyo and not closer to their home, Hirosaki. Owarikan Ryu Sojutsu: The school from Nagoya (with a branch dojo in Tokyo which I will surely be visiting soon) is slowly becoming one of my favorites! 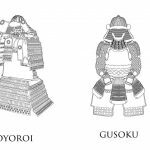 Besides their trademark free-style with the protecting equipment showcasing their unique kuda tube (through which the yari slides) and the engetsu circling thrust, this time they performed a panorama of their art’s evolution with practitioners executing the kata in yoroi armor and plain Edo-period clothing side-by-side. This time Owarikan Ryu didn’t perform their full rendering of Yagyu Shinkage Ryu kenjutsu; instead, they demonstrated a very interesting set of two practitioners utilizing the long-handle nagamaki as well as a set were two members in yoroi wielded the extra-long odachi with the right hand grabbing the blade itself through the use of a wrap. A superb presentation of a long and honored tradition. Mizoguchi-ha Itto Ryu Kenjutsu: Like other Itto Ryu interpretations, the school from Aizu/Fukushima puts the long sword against the long sword and against the short sword and explores conflict in various distances. 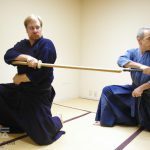 Even though this is an early Edo period tradition, the kinesiology is very close to that of the modern kendo kata although the ending of their long sword kata demonstrates something that is sadly lacking in many kendoka, i.e. the importance of not turning your back even when the “match” is over: in all kata, the losing side practitioner is cut to the back as he tries to escape. Kashima Shinto Ryu Kenjutsu: Like the Bokuden Ryu, the Kashima Shinto Ryu has its origin in the art of the legendary Tsukahara Bokuden, master of the Katori and Kashima traditions. 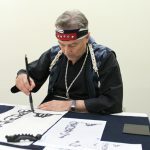 And even the appearance of the practitioners reflected their Muromachi period origin: donning hachimaki headbands, tucked-in-belt hakama and tasuki cords to hold the sleeves the Kashima-based school members demonstrated a very old-school kenjutsu using bokuto, fukuro shinai and real swords. 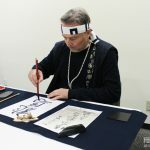 I am sure that for those (like this writer) with a particular interest for pre-Edo kenjutsu, the Kashima Shinto Ryu demonstration must have been one of the event’s highlights. Morishige Ryu’s explosive finale was a visual and aural counterpoint to the subtle Ogasawara Ryu opening – you can’t imagine the noise a matchlock musket (let alone half a dozen of them) makes in a huge hall unless you hear it! We got out in the chilly afternoon; the bright sun had started melting the snow but there were still one-two feet piles all over the place and along the moat surrounding the Kitanomaru gardens. I took a few parting pictures of the landscape which, oscillating between the urban and the medieval, perfectly reflects Japan itself there, at the feet of its elusive monarch. The sight of the Budokan’s octagon roof brought to mind Ota Dokan, the warrior who built the castle of Edo and Tokugawa Ieyasu, the warrior who made it famous all over the world – it took me more than a day to realize that the thought of “Deep Purple” hadn’t even crossed my mind.